Thank you for your faith in the people whom we serve, people who live in places so remote that it’s almost unimaginable. Thank you for remembering us during times when the needs of others appear to be more pressing. We begin each staff meeting with a prayer for you, and we keep you in our own daily prayers, too. ONE MINUTE: (left) It’s one minute to air time. Public affairs director Amy Flaherty prepares to host a one-hour call-in program discussing teen pregnancy, with news director Paul Korchin assisting. Name almost any problem, and western Alaska suffers it at a rate that’s at least double the national average. Suicide, for example, is the region’s number one cause of death. View more statistics from October's issue. Our job is to continue to inspire western Alaska villagers with inspirational spots and Catholic programming, to educate and inform them, and to provide respectful forums like this one discussing solutions. INSPIRATIONAL SPOT: Dear God, help me see that this is not just another day. Open my eyes so I can clearly see the unique promise that this day holds. Open my mind so I can clearly understand the message and messengers You send my way. Open my heart so I may lovingly accept the challenges, blessings and surprises that You so lovingly will provide me today. FINANCIAL REPORT: For the year ending June 30, 2005, KNOM suffered a small loss and had to dip into emergency savings to make ends meet. Our income totaled $1,013,689, while expenses totaled $1,166,931. 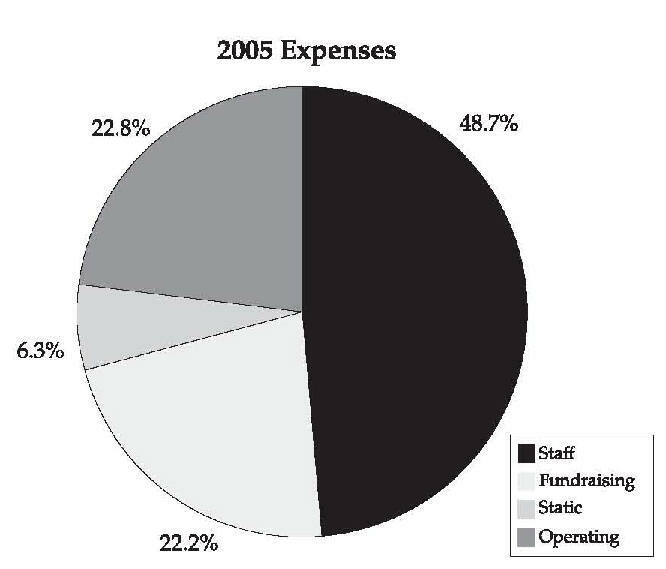 Donations were the source of 96.7% of KNOM’s income. Interest on savings accounted for 2.3%, while underwriting of programs, lease of tower space and everything else contributed 1.0%. The mission’s expenses (left) have been relatively steady for the past several years. “Fundraising” is our cost of finding new contributors to replace the approximately 15% of our donors who drop off every year. We are also trying to increase the number of our donors in order to meet rising expenses. As a result, this category is a little higher than normal. “Operating” includes all non-staff related expenses, such as utilities, fuel oil, supplies, news network and teletype, and so forth. The “Staff” category includes salaries, volunteer stipends and food allowances, air fares for volunteers and the cost of heating and maintaining the volunteer house. If you would like a copy of KNOM’s detailed financial information, or have any questions, please feel free to contact business manager Lynette Schmidt. BOOK ‘EM: The first week of December, the upcoming book of KNOM history was being proofread. The 288-page book includes 128 photos, 131 inspirational spots, a complete list of KNOM volunteers since 1966, a list of the station’s many awards, and a bibliography of articles published on the mission since 1967. 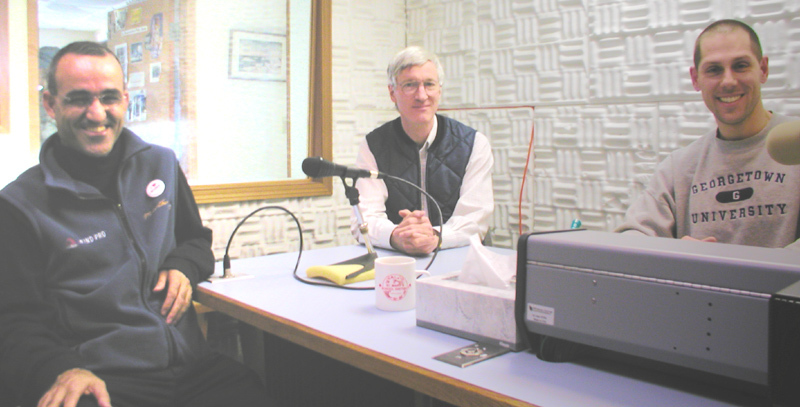 The work has taken KNOM financial officer Tom Busch much longer than he’d thought, detailing the many successes and struggles of the oldest Catholic radio station in the United States. HAIL TO THE CHIEF: We’re happy to announce that KNOM general manager Ric Schmidt has been re-elected to a second term as president of the Alaska Broadcasters Association, the trade group for radio and TV stations across the state. STOCK ANSWERS: Some friends of the KNOM mission choose to give by means of stocks or bonds. These can be given to "Catholic Bishop of Northern Alaska/KNOM," account number 3096-0426, Ragen McKenzie, Inc., attention Krista Stamper. Their address is 613 Cushman Street, Suite 110, Fairbanks, AK 99701, phone 907-451-7767, DTC number 733. Please notify KNOM general manager Ric Schmidt of the gift so that you can be properly thanked. Thank you for your kindness! January: It’s a busy month. KNOM’s Amy Flaherty is in the St. Lawrence Island village of Savoonga to spread word about a three-day wellness conference, held in the wake of a rash of suicide attempts by children. While there, she discovers that the whistling one hears is a form of Siberian Yupik, the language of the island. The whistling comes as news to some linguists. 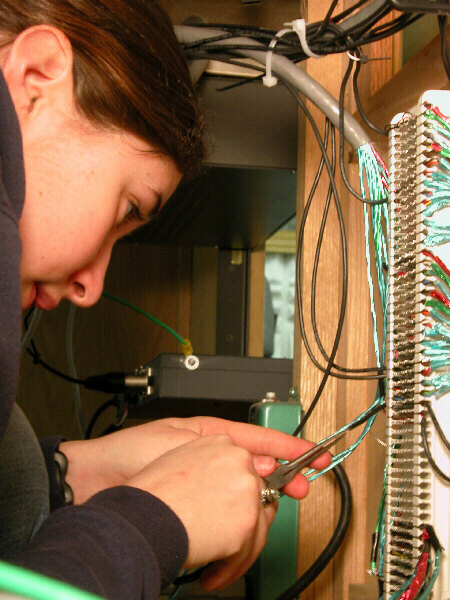 At the same time, general manager Tom Busch finishes re-wiring interview Studio C, with the help of volunteer Anna Dummer (left), who assists by working in hard-to reach places under the counter. January 18: A two-month murder trial begins, Nome’s most controversial in a half-century. The judge gives news director Paul Korchin a front-row seat, and permission to record the proceedings. February: (left) Paul Korchin interviews Kani Xulam, the unofficial representative of the five million Kurdish people, spreading word of their plight. March 15: Gale winds rotate an insulator, causing a wire on the KNOM antenna to burn through, 160 feet above ground. This forces KNOM to severely lower power during windy periods until repairs May 11th. 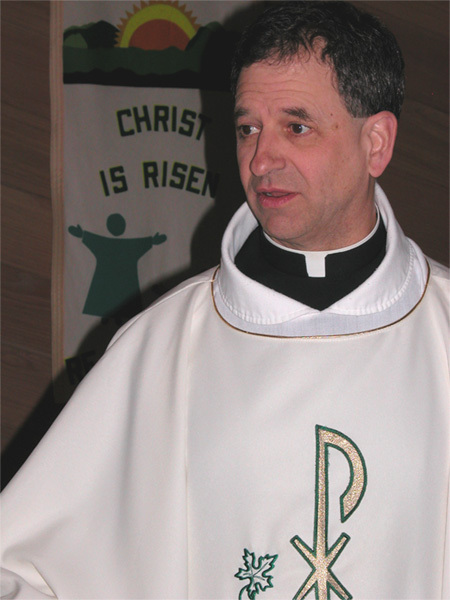 March 25: (left) Fr. Mark Hoelsken, SJ offers a Mass of Thanksgiving prior to the departure of Tom and Florence Busch, who are moving to Anchorage. It’s a celebration of the many people who have made KNOM possible over the years. Florence has devoted 20 years to the mission, Tom 33, 30 of them as general manager. April 12: The couple fly to Anchorage. Tom becomes KNOM’s financial officer and development director. Ric Schmidt, who has been KNOM’s program director for ten years, is elevated to general manager, and Kelly Brabec (left) rises to program director. It is a happy and smooth transition. 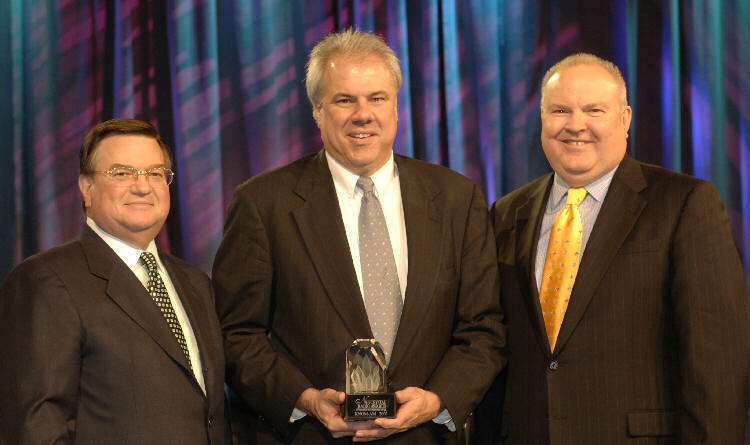 April 20: (left) In Las Vegas, Ric Schmidt accepts KNOM’s third Crystal Award for Excellence in Local Achievement. He is flanked by, at left, National Association of Broadcasters CEO Eddie Fritts, and at right, NAB board chair Bruce Reese. In his speech, Ric honors KNOM’s many contributors. June 13: NAB pays all expenses for Paul Korchin to travel to Washington, DC for a black-tie dinner honoring local service provided by radio and TV stations. June 25: For Tom Busch, it’s a 14-hour visit to Seattle, where Alaska broadcast pioneer Augie Hiebert, is given a lifetime achievement Emmy Award. It was Augie who supervised KNOM’s application to the FCC in 1968. 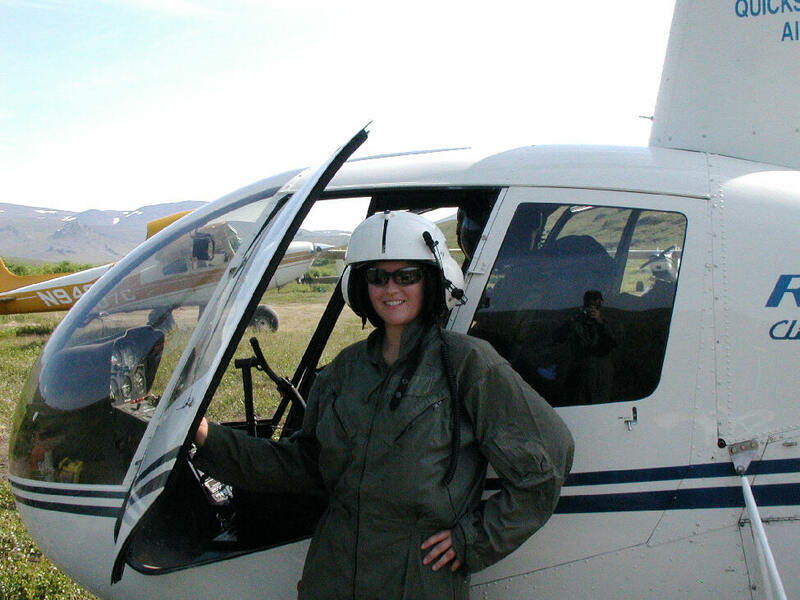 August: KNOM’s Amy Flaherty flies 360 miles up the coast to Point Lay, where Nome audiologist Phil Hofstetter is stuck due to adverse winds and waves. He eventually gives up his attempt to kayak to Barrow, his trip designed to raise money and awareness for cancer screening and treatment. It’s a flying month for Amy (above left), who also travels to remote Serpentine Hot Springs in this helicopter to cover archaeological investigations by the National Park Service. 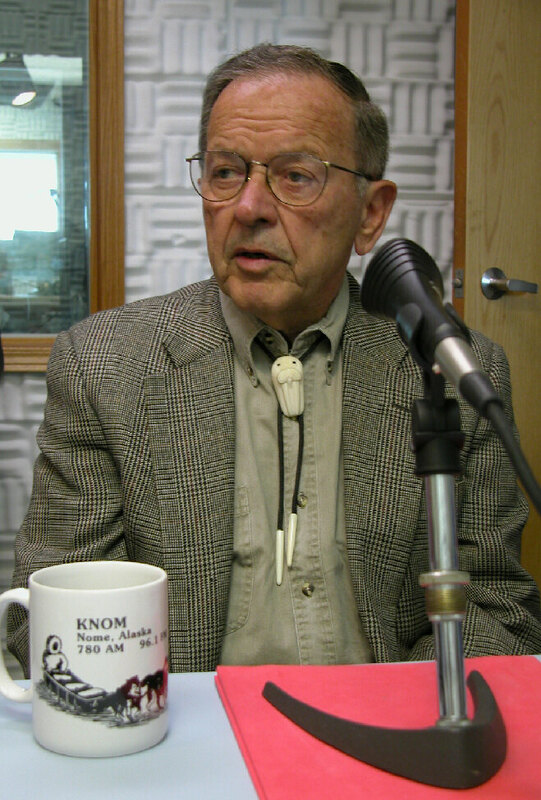 August 2: (Left) Senator Ted Stevens holds a press conference for KNOM and other media in KNOM Studio C. As Stevens is third in line for the U. S. Presidency, KNOM is briefly guarded by three Secret Service agents. 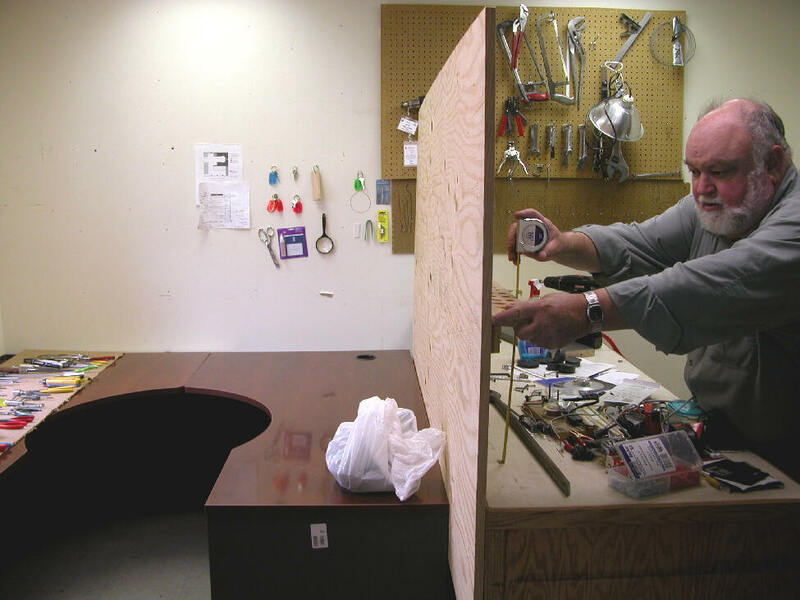 (Left) Visiting from California in August, former chief engineer Les Brown partitions off the engineering shop to make room for a new editing studio. Les returns in November to fix miscellaneous gear and inspect the tower. September 23: One of the worst storms in the last hundred years is pummeling Nome. Ric Schmidt flies home from the east coast. 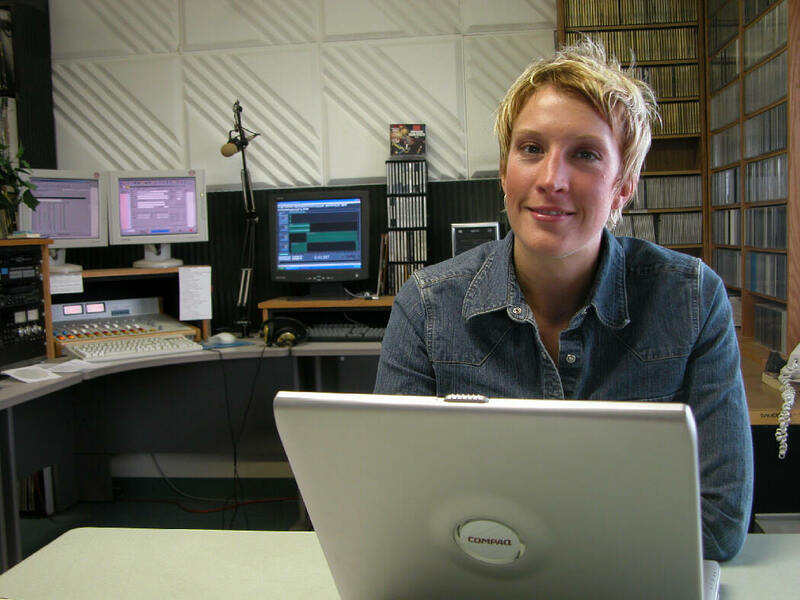 The next day in Silver Spring, MD, with Ric Schmidt back in Nome, Kelly Brabec represents the station as it receives its thirteenth Gabriel “Radio Station of the Year” Award. 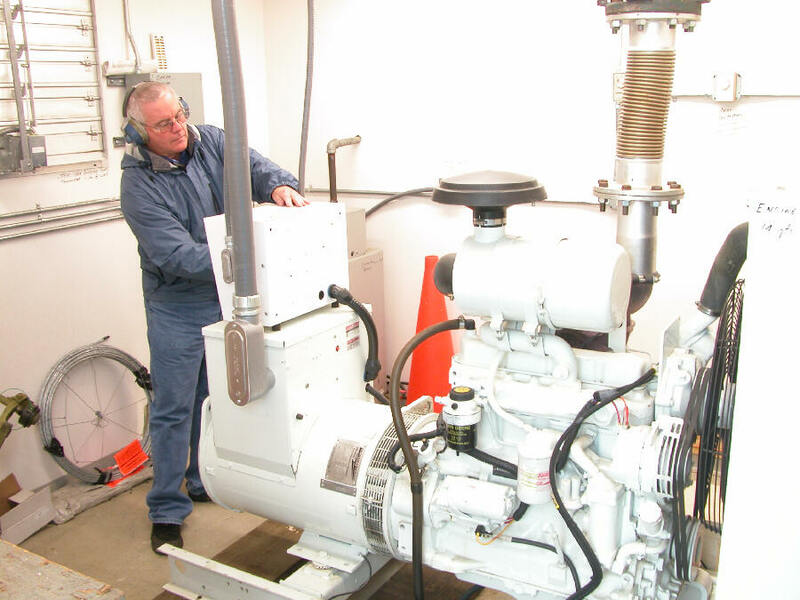 Two days later, (left) Tom Busch is in Nome, inspecting the transmitter site’s generator. The storm has knocked down a quarter-mile of utility poles, and the generator is keeping the station on the air, running a total of six days. The only KNOM casualties of the storm are siding torn off the building, and the KNOM Christmas star atop the tower, apparently hit by flying debris. 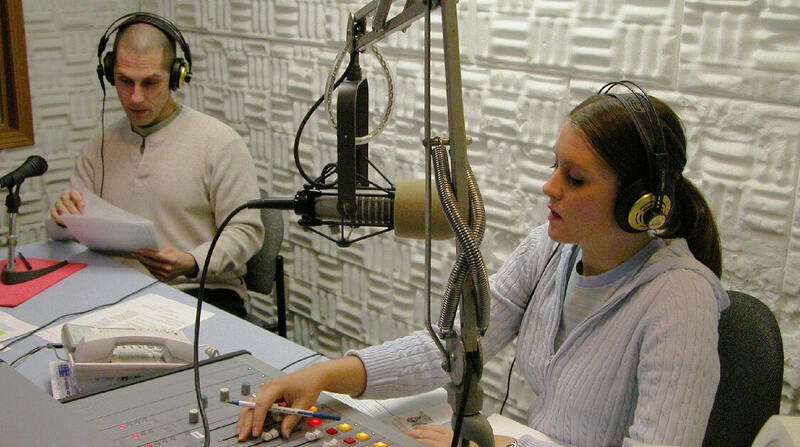 Over the course of this year, KNOM has broadcast 34,000 inspirational spots and 34,000 educational ones. We’ve broadcast the Mass and Rosary. Hundreds of programs we’ve produced addressed vital issues like wise parenting, mercury in native foods, search and rescue efforts, child literacy, Fetal Alcohol Effects, gun safety, diabetes prevention, alcohol and drug abuse, domestic violence, child abuse, juvenile justice - and many, many more. We thank you for your generosity and your kindness. Without you, this important work would come to a quick end. Thank you for joining our effort to inspire the far-flung people of western Alaska, and help them improve their lives. God bless you!